With the economic downturn over the past few years, one question that is often asked is what will help the economy grow and become more stable? Perhaps the answer is jobs based in Science, Technology, Engineering and Mathematics (STEM). The U.S. Department of Commerce utilized occupational codes to identify STEM occupations and calculated the rate of growth for these occupations. The results were astonishing. In 2008 there were approximately 6,394,000 STEM jobs and it is estimated that by 2018, there should be approximately 7,501,000 STEM jobs, a 17.31 percent growth. These 50 occupations will create another 1,107,000 jobs in the US by 2018. 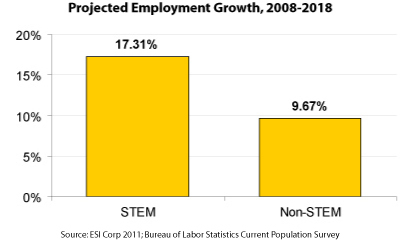 STEM jobs are projected to grow 17 percent from 2008 to 2018, compared to about 10 percent growth for Non-STEM jobs. In 2008, there were 141,520,700 Non-STEM jobs and it is estimated that by 2018 there will be 155,198,900 Non-STEM jobs, representing a 9.72 percent change. Although the overall number of Non-STEM is greater than STEM jobs, results indicate that STEM jobs will grow at a faster rate. Not only are STEM jobs growing faster than Non-STEM jobs, the wages between the two vary significantly. Wages were calculated using eight variables: employment status, age, highest level of education, class of worker (private), weekly earnings, hours worked in a week, outgoing rotation weight, and occupation code. Five different sets of wage estimates were calculated each pertaining to one of the four geographic regions and the nation. The four regions include the Northeast, Midwest, South, and West, as depicted in the map below. In all the regions and the nations as a whole, earning power increases with higher levels of education. The Northeast typically has wages higher than the national average while the Midwest typically has wages lower than the national average. On average, STEM workers with a graduate degree earn $11 an hour more than STEM workers with a high school diploma or less. By mousing over the map below, you are able to explore the STEM data by region.